Determine the total sulfur content of liquid or gas phase samples to ensure process optimization, maximize profitability, and maintain regulatory compliance with the Thermo Scientific™ SOLA iQ On-line Sulfur Analyzer. 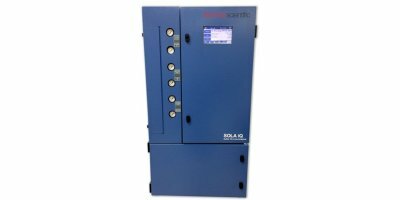 Utilizing unique Pulsed UV Fluorescence technology and the proven Pyrolysis system, the SOLA iQ analyzer builds on the success of the SOLA II range of total sulfur analyzers with an install base of thousands of units at the world’s leading oil & gas companies. Digital Data Communication: AutoCONFIG™ software: Security protected access to all analyzer setup and configuration parameters and all process and diagnostic data. Connect via a standard PC across your Local Area Network. Download 30,000 data records (process and analzer functions), typically up to 24 hours of records (user configurable). Connect via Modbus for remote access and control of all analyzer functions and data. Connnect with RS485 or TCP/IP. Display: Front panel mounted 7' color touchscreen user interface to access analyser functions and diagnostic data including sulfur concentrations, oven and furnace temperatures, PMT and lamp voltages, detector flow rate and more. The SOLA iQ On-line Sulfur Analyzer replaces expensive and time consuming laboratory sampling for measuring total sulfur in refinery products including gasoline, diesel, kerosene, and jet fuel as well as many process gas samples such as Natural Gas, NGL and SynGas. The SOLA iQ analyzer offers an online adaption of ASTM D5453, D6313, D6222 & ISO 20846. No reviews were found for Model SOLA iQ - On-line Sulfur Analyzer. Be the first to review!